Wondering how Antsy Pants ™ compare to other All-In-One diapers? Find out here. Wondering how Antsy Pants ™ compare to cloth training pants? Find out here. Wondering how Antsy Pants ™ compare to fitted diapers? Find out here. Wondering how Antsy Pants ™ compare to one-size cloth diapers like bumGenius? Find out here. Wondering how Antsy Pants ™ compare to other pocket diapers like Fuzzi Bunz and bumGenius? Find out here. Wondering how Antsy Pants ™ compare to DSQ prefolds? Find out here. Wondering how Antsy Pants ™ compare to waterproof trainers? Find out here. Wondering how Antsy Pants ™ Pull-Up Cloth Diapers compare to waterproof training pants? Find out here. Still have questions about our Antsy Pants ™ Pull-Up Cloth Diapers? Here are answers to some frequently asked questions. Want to know more about the design of Antsy Pants ™ Pull-Up Cloth Diapers and why they are so great for active toddlers? You'll find details here. Antsy Pants ™ Pull-Up Cloth Diapers teach important potty skills for quicker, easier potty training when you are both ready. Reusable pull-up toddler diapers, perfect for new-to-cloth toddlers. Learn more about receiving emailed potty training tips and occasional offers from GetAntsy.com, and receive our FREE Potty-Ready Quiz so you can judge how easy or difficult your road to potty training your child may be if you start right now. Antsy Pants ™ are pull-up cloth diapers, perfect for your active toddler. Whether ready to potty train or just want better fitting, more comfortable diapers for your mobile baby or toddler, come learn more about Antsy Pants ™. Find all the information you need about the different versions of Antsy Pants and how they are sized. Are you already using cloth diapers but are looking for a solution that works better for your toddler than the diapers you used when your child was an infant? Learn more about how Antsy Pants ™ are different, as well as what is the same as some of the other brands of cloth diapers on the market. Want to know how the cost of Antsy Pants ™ compares to using disposable pull-up training pants? We break it down for you based on your child's starting age. Receive our FREE Potty-Ready Quiz so you can judge how easy or difficult your road to potty training your child may be if you start right now. Not all cloth diapers are created equal. Here are some things to think about as you research the right cloth diapers for your family. Want a way to potty train with Antsy Pants™ while spending only monthly diaper budget or less? The answer is here! Check out the Antsy Pants™ Potty Training Blitz Lease Program. Keep things dry at night with Antsy Pants™ without the up-front investment. Check out the Antsy Pants™ Dry Nights Lease Program. Check this page for more information on Antsy Pants sizing and how to select the right size New To Antsy Pants™ Package for your child. Cloth diapering can sometimes take a little debugging to figure out how to keep moisture inside. Learn how to solve cloth diaper leaks in this handy troubleshooting guide. Your privacy is very important to us. We do not sell or otherwise disclose the information our customers share with us for ANY reason. Tell friends about Antsy Pants and GetAntsy.com and receive special offers. Accrue free gifts as your friends make purchases. Check this page for more information on Antsy Pants sizing and how to select the right size for your child. Have an Antsy Pants story you'd like to share? We'd love to hear it. If you dread changing your toddler's diapers and put off potty trips because it's a hassle, you need to find out what toddler diapers are and how to find them. 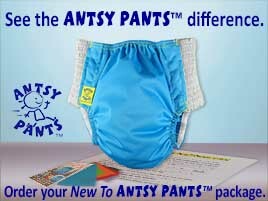 Antsy Pants ™ Pull-Up Cloth Diapers are great for overnight use on toddlers and older children. So many parents put diapers on their young children every day with out stopping to think about what is important to them. Do you only care about basics like holding wetness, or are health concerns also important to you? Is convenience at the top? But what defines convenience? And did you know that the diapers you choose impact development milestones? Which are most convenient; disposable diapers or reusable cloth diapers? You often hear that disposable diapers are more convenient than reusable cloth diapers. Is it possible that it is not the case after all? See this point by point comparison and decide for yourself. Which Version of Antsy Pants™ is for you? Need help deciding which version of Antsy Pants™ is for you? Find everything you need here. Why Antsy Pants™ Pull-Up Cloth Diapers? Find all the information you need about Antsy Pants™ Pull-Up Cloth Diapers here. The articles listed here will help families decide whether cloth diapers are right for them.